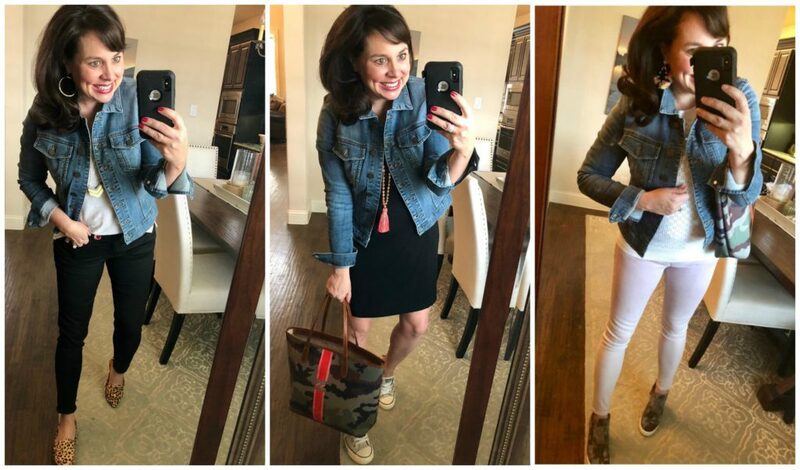 Every single week I’m surprised by the number of people who ask me about two things: 1) my denim jacket and 2) the cross body strap I have on my Louis Vuitton bag. What is even more surprising to me is that some of you, even those that have followed me since the beginning, still haven’t taken the plunge on my MUST HAVE DENIM JACKET. Ladies. Have we not built up a trust over the last 6 years? We are going to start by talking about my much beloved 1st KUT denim jacket. The one named a MUST HAVE 6 years ago, and the one that continues to be my favorite. The one that I still wear multiple times a week. The one that’s been washed hundreds of times. The one that’s been taken to countless dinners and movies. The one that I’ve shoved in a purse so many times “just in case” I need it. I have a deep and abiding love for it. For size reference, my jacket is a medium. I often size up to a medium in jackets, so I do think the jacket is true to size. I present to you Exhibits A-W. Seriously, A-W. I mean, it’s a wonder it took me this long to become a Kut from the Kloth brand ambassador. I’ve been preparing for 6 years! Ha! And that’s just some of them y’all. And that’s just the tippity top of the iceberg, y’all. 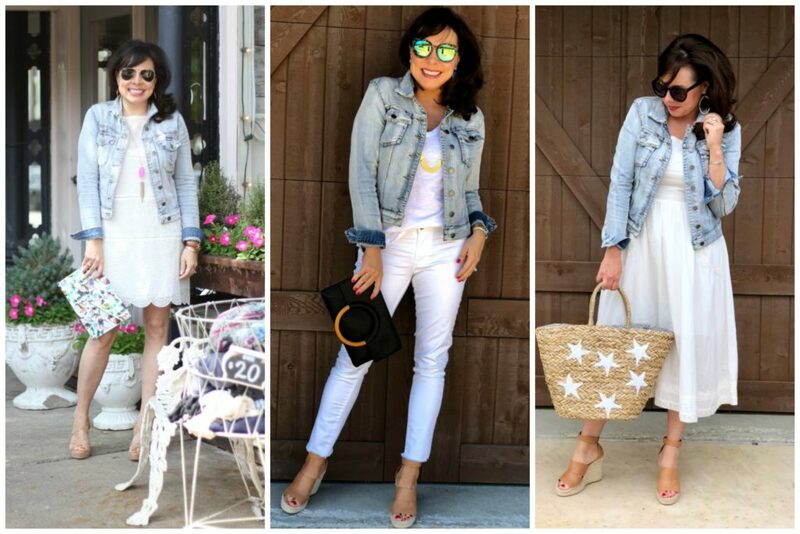 I had to include this collage too, because this dress is 20% OFF right now! It has 2,800 reviews, and almost all of them are 5 STAR! The fabric is soft and comfortable, and the draping and ruched sides make it very flattering. 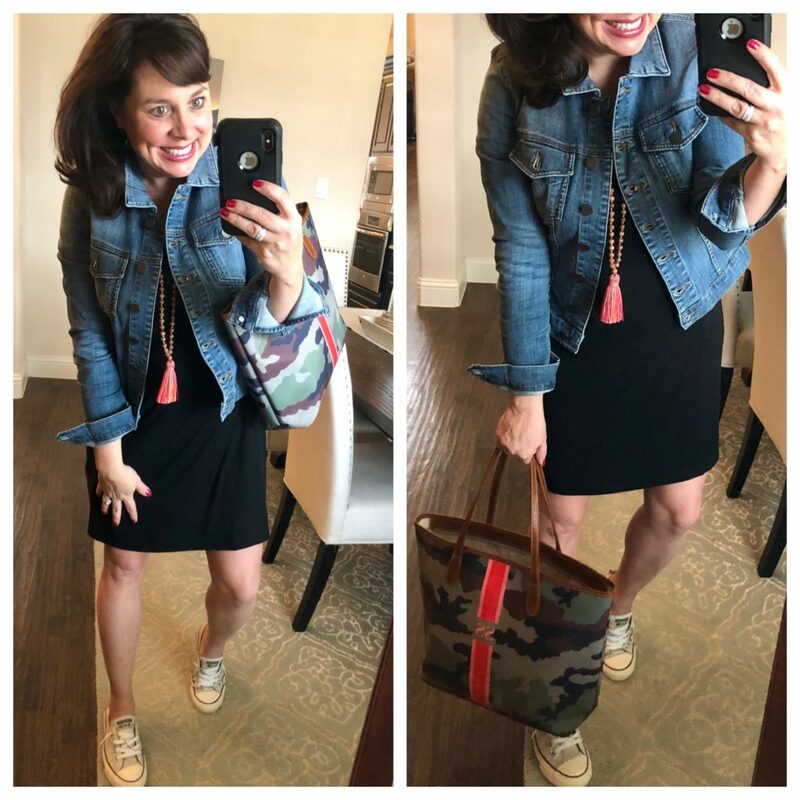 I personally won’t wear this dress without a denim jacket (or maybe a military jacket! ), because it is body conscious. 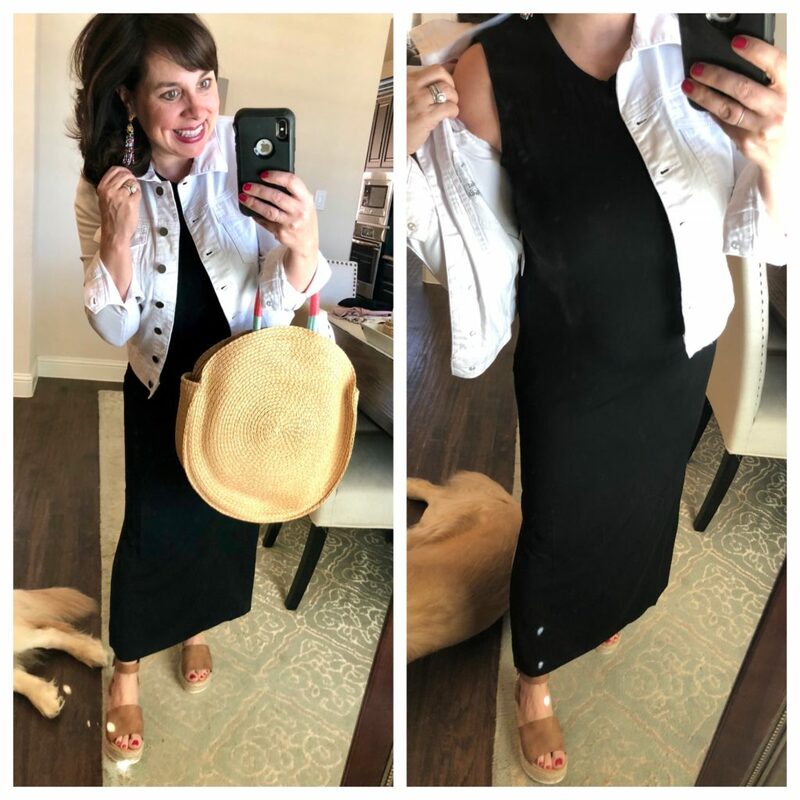 I’m wearing a medium in the jacket and the wedges are true to size and oh so comfy. It comes in 8 colors, so there is something for everybody! Now you will see some of my more recent outfits where the other items in the outfit are still available. Because yes, I’m still wearing it like crazy SIX YEARS LATER. 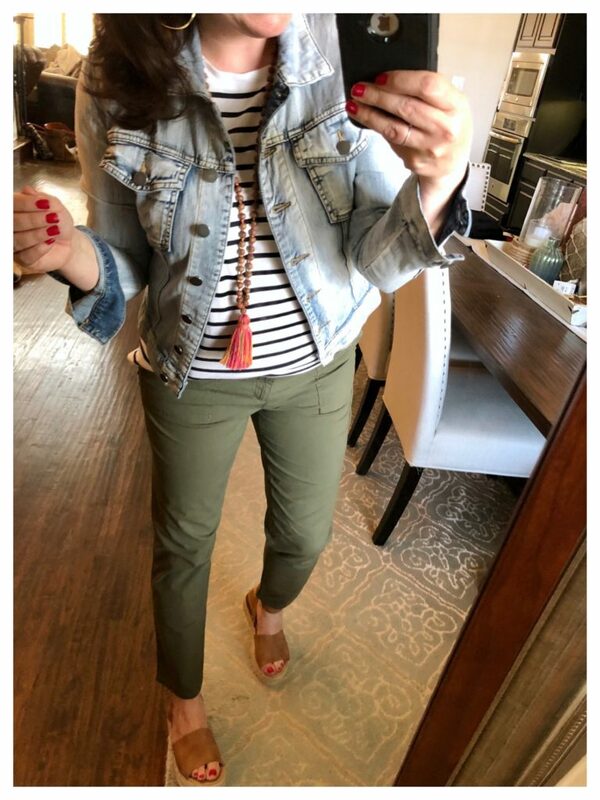 Click HERE if you want my thoughts and or sizing information on this outfit. And if you want to grab my favorite spring and summer necklace, you can get it without the standard $6 shipping right now (no code needed)! 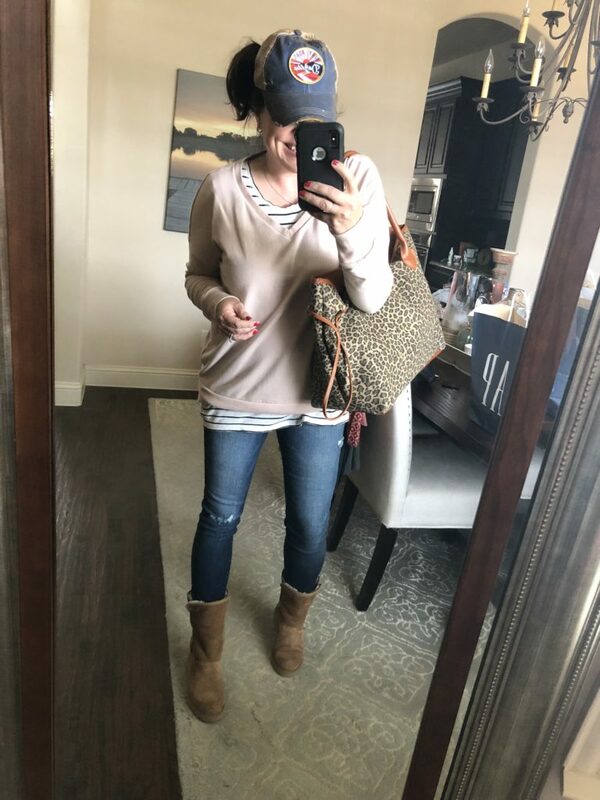 Click HERE if you want my thoughts and/0r sizing information on this outfit. 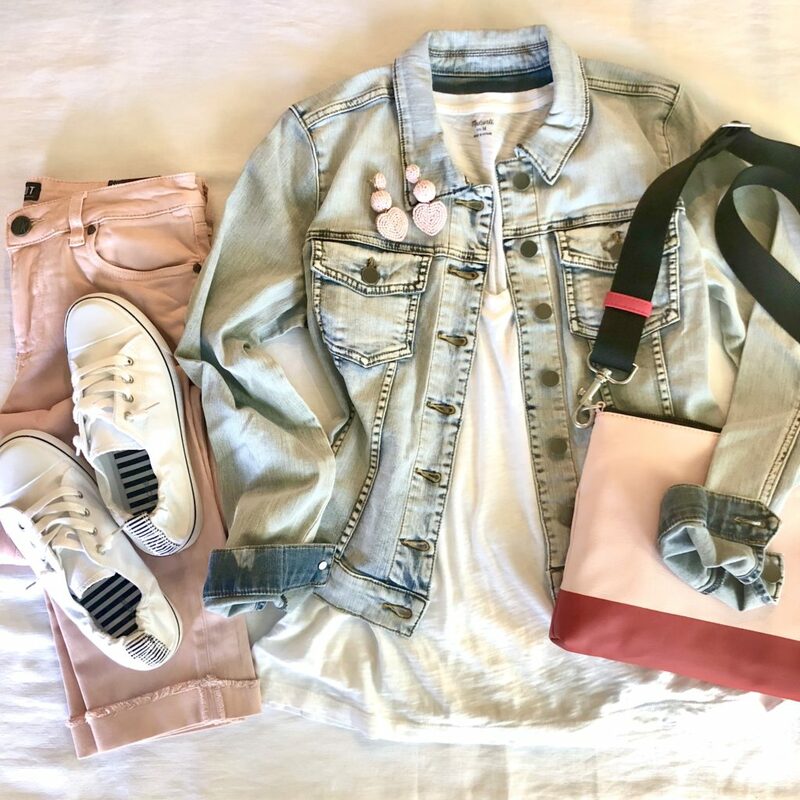 Here’s a new flat lay pairing the jacket with a darling pair of blush boyfriend jeans, pink earrings, and a pink and red cross body bag. The pinks aren’t matchy matchy, and I happen to like that they are varying degrees of pink. And the shoes, y’all! 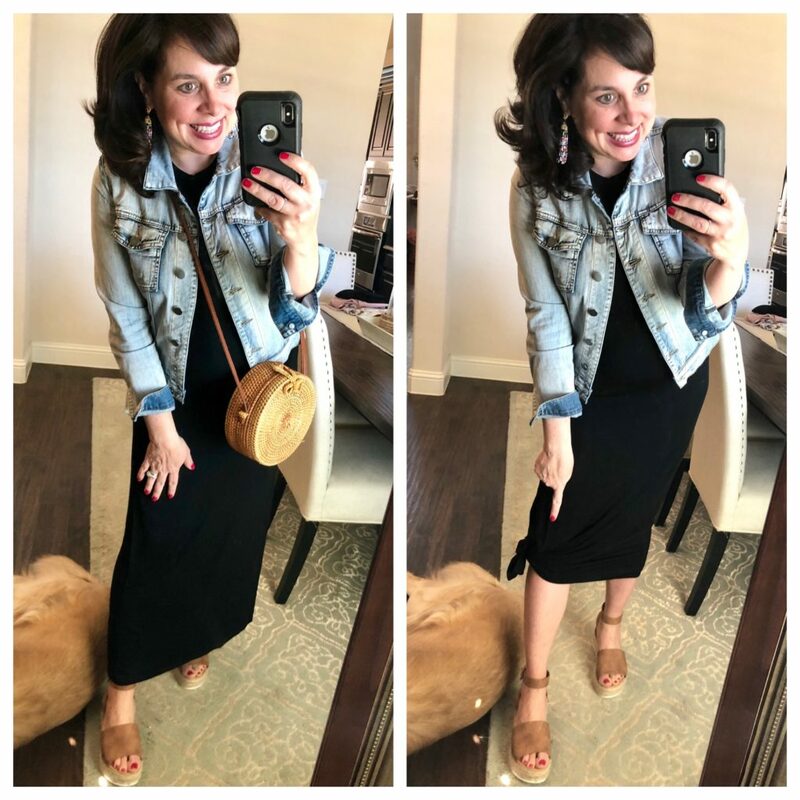 Did you see my Walmart post from Monday? 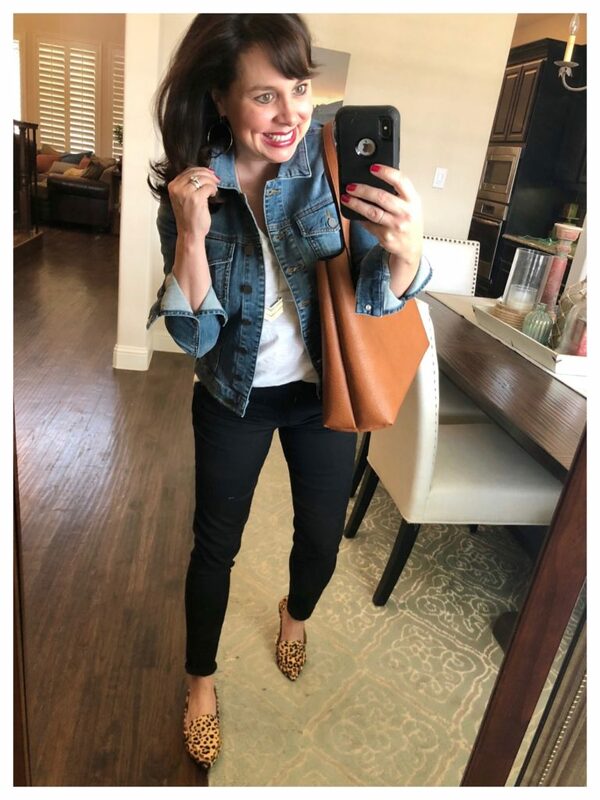 Because the shoes are from Walmart, ladies! If ordering the jeans, I think they run quite small, so I would definitely size up. 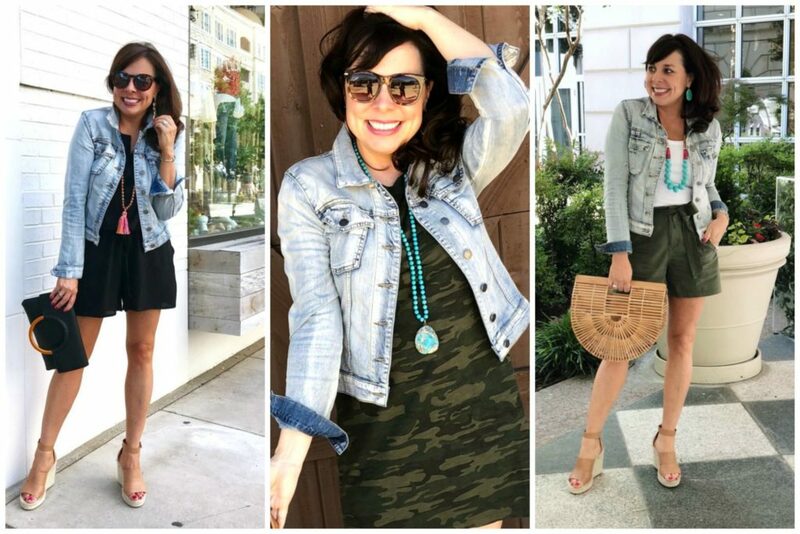 Back in September I added this dark wash denim jacket to my closet. Here I am wearing it when headed to L.A. for the Gibson Glam shoot! 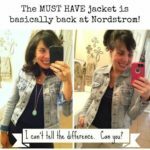 These jackets are perfect for travel because they are stretchy and comfortable! And then when I started the brand ambassadorship, they sent me this medium wash to try. And I of course loved it too. 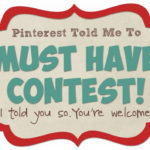 Click HERE for the original post. 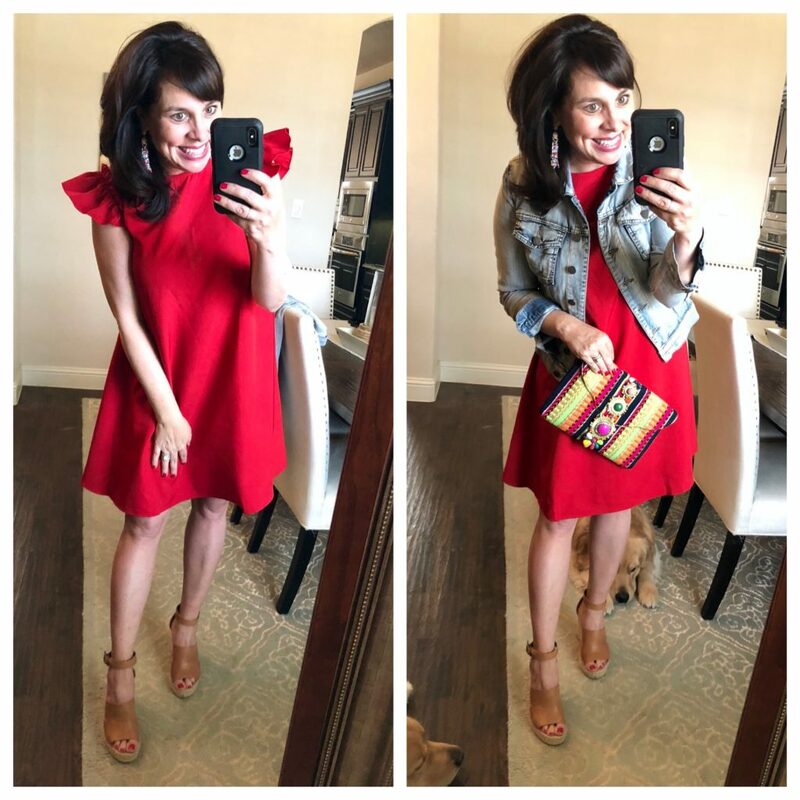 And listen to this…THIS DRESS IS ONLY $18! And it comes in 12 colors. For size reference, I’m wearing a small. So that’s it. 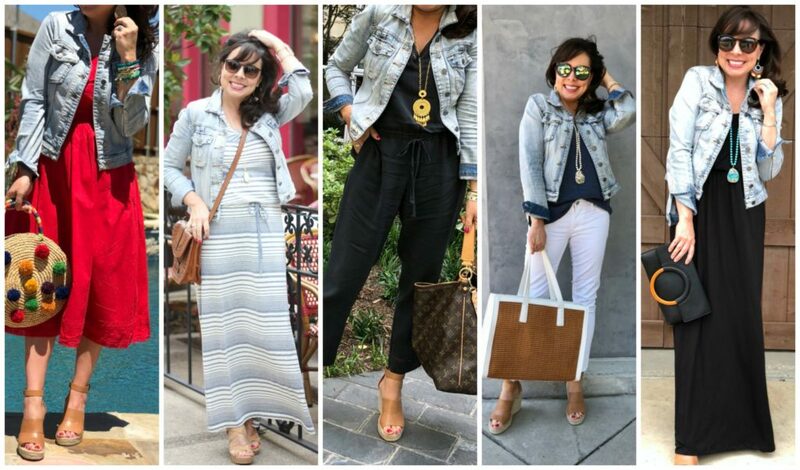 My ode to the KUT denim jackets. 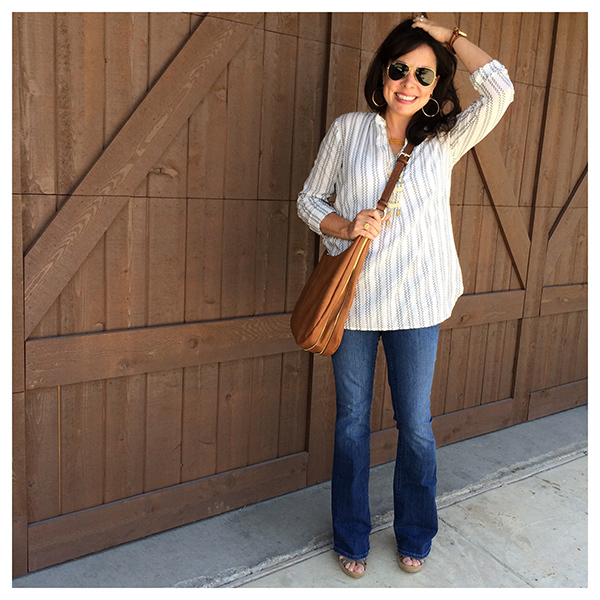 They are flattering, stretchy, comfy, AND YOU WILL WEAR THEM ALL THE TIME. Please just trust me on this, y’all! With free shipping and free returns, you have nothing to lose! Before you go today, I’ve got a bonus item for you! 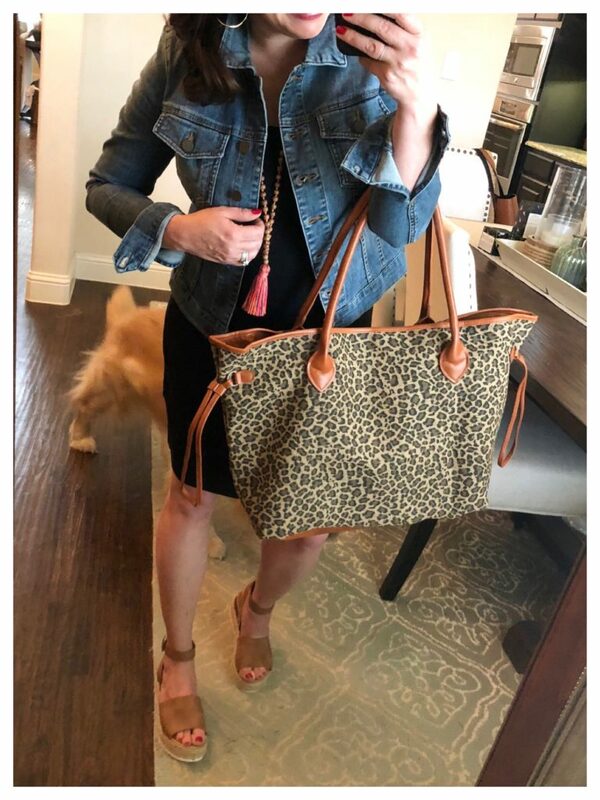 A couple of weeks ago I mentioned a leopard tote that I got from Amazon. I hadn’t shown it to you yet (the first one I showed you sold out immediately and never restocked) because it’s been out of stock since that first mention, but now it’s available! And y’all it’s crazy good. I do highly recommend adding the x-large insert/organizer to your order because the tote doesn’t have much structure, but this tote is an incredible value at $25.98! I love how the ties on the side can be cinched in just a bit. It has one magnetic snap closure, faux leather handles and ties, and 4 brass feet. It’s really big and can hold ALL THE THINGS. I took it to the ranch several weeks ago, and I thought it was worthy of a glamour shot. It also went with me on errands. And to Carter’s soccer game last weekend where it was FREEZING. It was 80 the day before! See you back here tomorrow! I’m talking accessories, and it’s gonna be good! 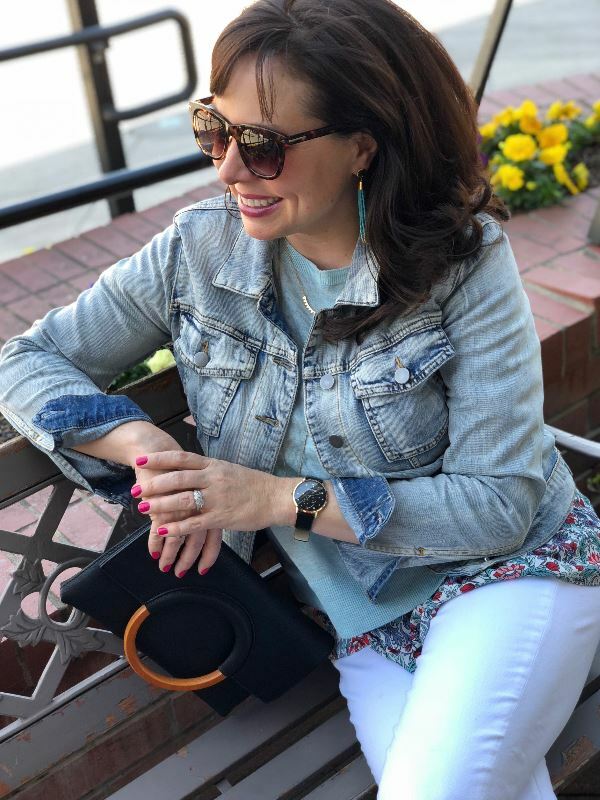 I found a little something that can add a whole lot of personality to your outfits, and it’s under $13! It’s been sold out for 2 years. 🙁 It was Chelse28 from Nordstrom. But I will have some options for you at the end of this month! 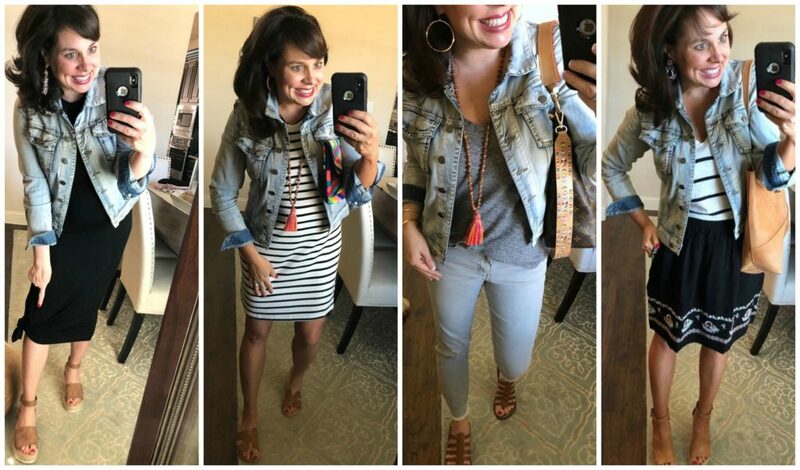 I hate to play favorites…but that denim jacket is probably the BEST thing you ever told me to buy! Right? And you were THE FIRST one to buy it! Don’t you remember me calling you from the mall to tell you about it?!? Hahahaha!!!! Is your favorite one sold out? I agree with Shay. I have bought many many many things from you throughout the years, but this jacket has to be my absolute favorite! 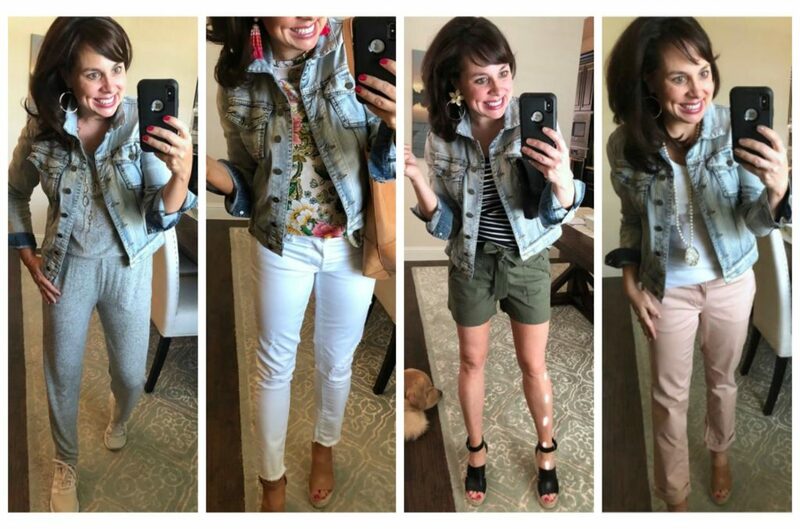 While I enjoyed A-W, I really could have looked at a ton more pictures of how to style that jacket. It goes with EVERYTHING!! 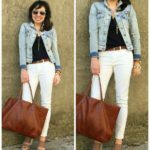 What is the color name for the light jacket ? Is it “sweet”? Thanks! I just adore this jacket! So glad I listened to you all those years ago! Hi! Can you share the link to the black skirt with the white embroidery on the bottom if its still available? Thank you!! I finally decide to jump off the fence after all these years, and it’s sold out. Serves me right. Well happy anniversary to us! 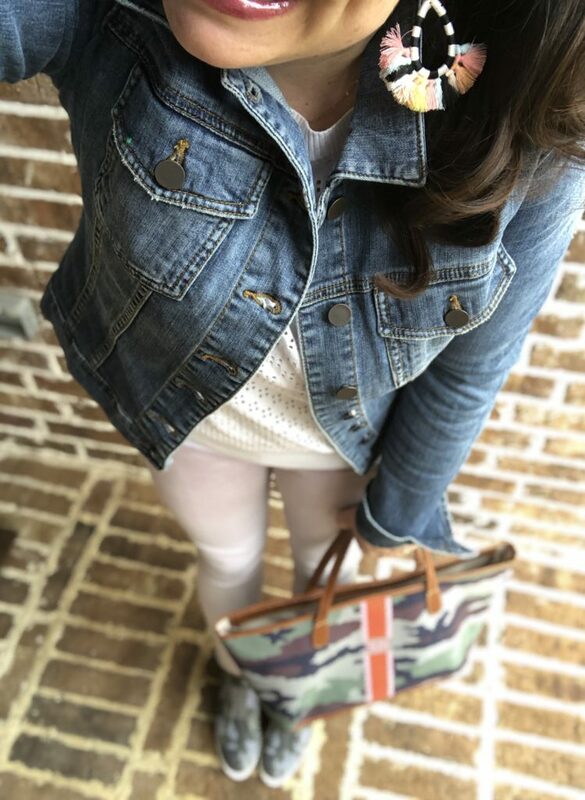 I’ve been following you for 6 years and the denim jacket is the first thing I bought! 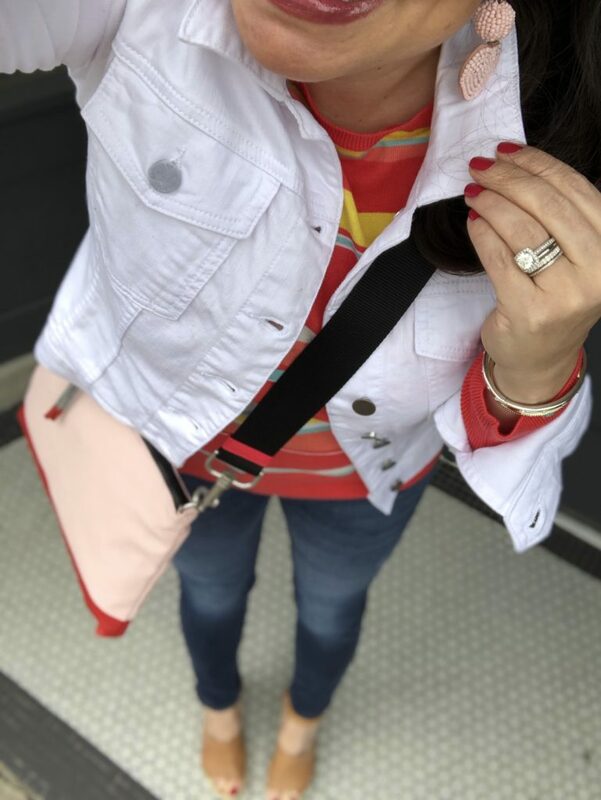 I wore out the elbows in the first light wash jacket and now I am on my second! I bought the medium wash last fall. They’re both terrific!! 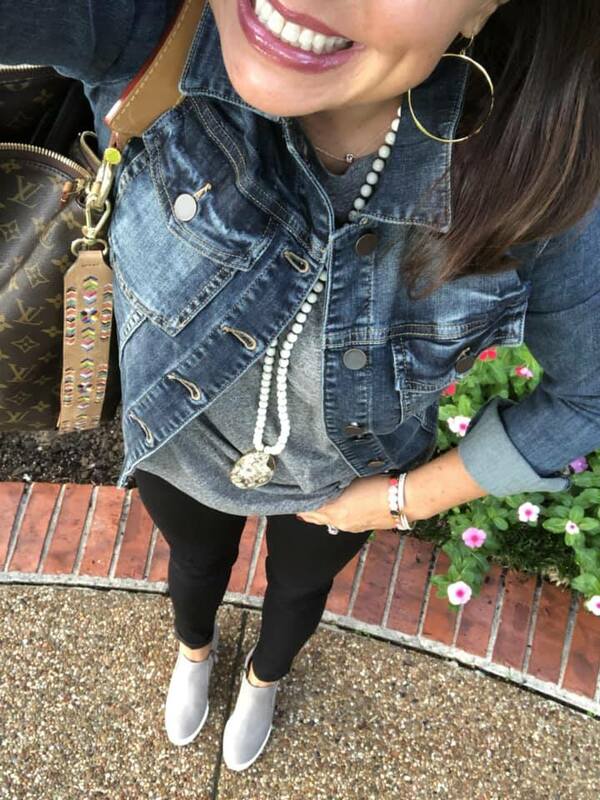 I’m a teacher and I wear them to school instead of a cardigan sweater; the jacket is that comfortable ! 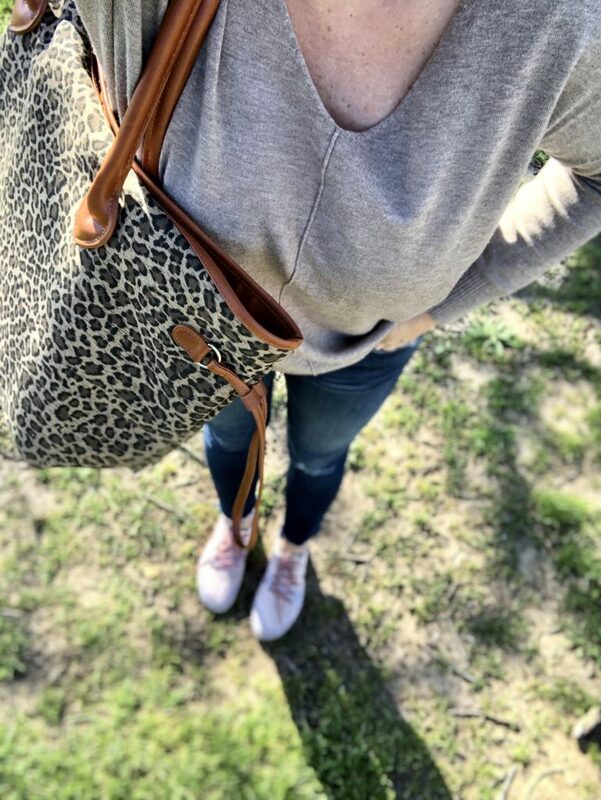 I am crossing my fingers they restock that leopard tote. I missed it again! It’s really cute, great size and great price. Ok Sheaffer…do you have any pull with Kut now that you are an ambassador? 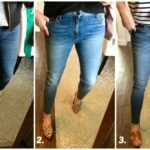 They need to keep petite jeans in the rotation! They are the only jeans short enough for my SHORT legs!! It is such a bummer when petites don’t get any love. I would love those button front ones but know they will be too long. 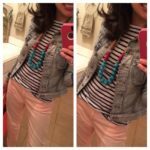 Free alterations at Nordstrom! I use them all the time and they will make the hem identical to the original. Short legs here so I feel your pain! 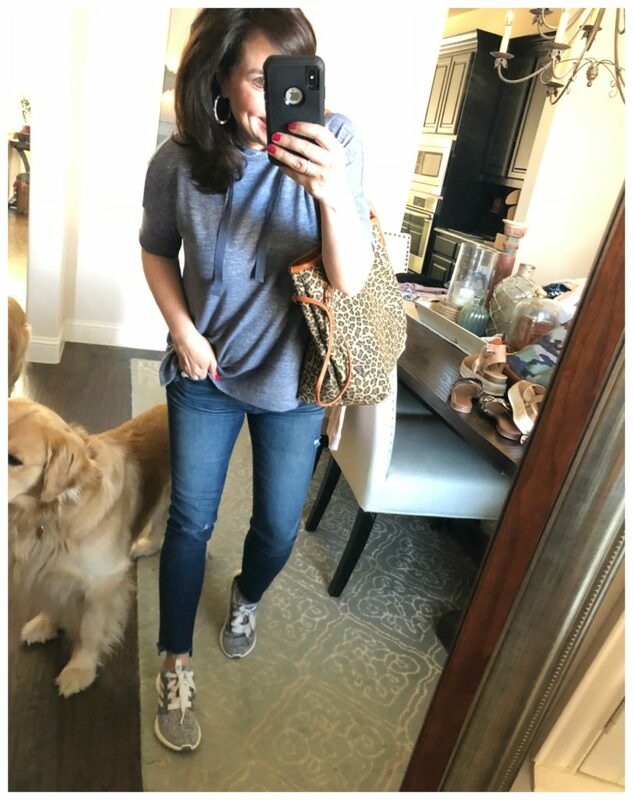 What size did you get in the Tshirt dress you are wearing with the leopard tote? Medium? It’s super cute! 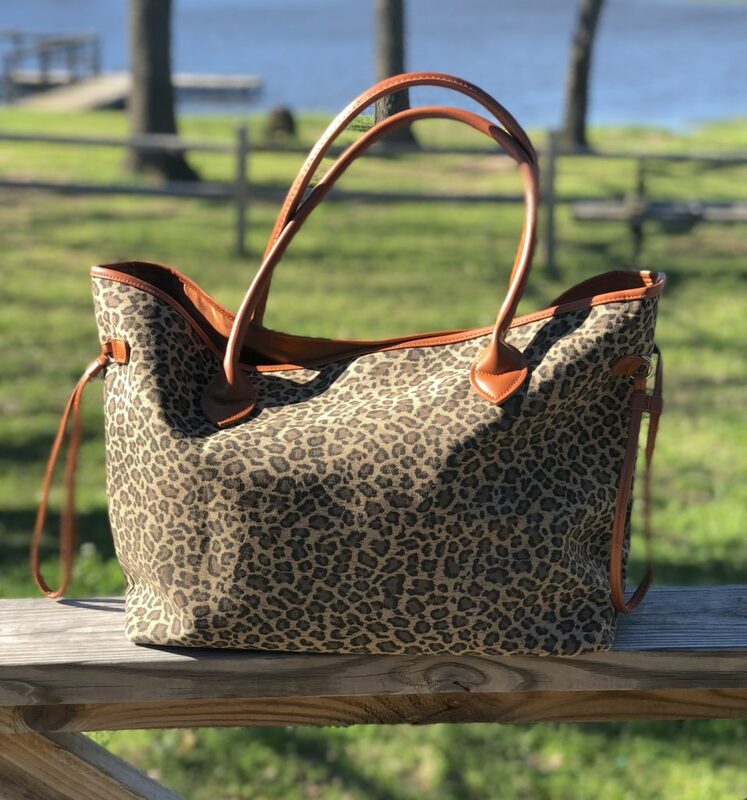 Only 9:15 am and the leopard tote is showing unavailable. 🙁 I was definitely going to get it. Would love to know when it’s back in stock. I love the low-profile wedges too. Did you get your regular size? Help! I only see the denim jacket in “Gratitude” and “Optic White”. Am I missing something? 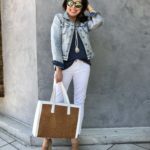 Amazon will let you preorder the tote – says available 4/17, so I did that! Hello, I keep seeing the LV bag from time to time but I can’t make out which one it is. Can u tell me? Ive been wanting a LV bag like that with a zipper for a long time. Question : all your old posts say you have the Must-Have Jacket in Small…but here it says Medium. I’ve been following you for over 5 years and have bought SO many of your wonderful suggestions. Why the heck did it take this long for me to order the “sweet” Denim jacket? Probably because I own a denim jacket and didn’t think I needed another. Boy was I missing out!! Got mine today and It’s SO awesome!! Thanks for highlighting it yet again!! Love it! !